Intel’s next generation Skylake-E / EP processors have been confirmed to feature support on the new LGA 3647 socket. When the new generation processors arrive, Intel will be ditching their LGA 2011-3 socket as Skylake-E processors will be bigger in dimensions compared to Broadwell-E and Haswell-E chips. The socket was pictured by the guys over at TweakTown and you can see it yourself in the picture below. From the looks of it, Intel is going all out with their next generation processors. The motherboard was built by Gigabyte and the socket was manufactured by Foxconn. The socket is clearly mentioned to host 3646 pin connections which is exactly 1636 pins more than the LGA 2011-3 socket. 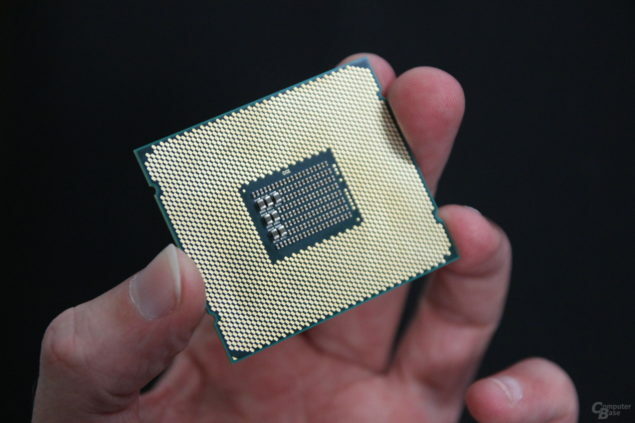 Since Skylake is based on the latest 14nm architecture, it warrants a new socket. Even on the mainstream side, Intel made the LGA 1151 socket allowing support of their Skylake desktop chips. The socket is only compatible with Skylake and the upcoming Kaby Lake processors. The LGA 2011-3 socket will last three years in the market after which Intel will shift to the LGA 3647 socket. 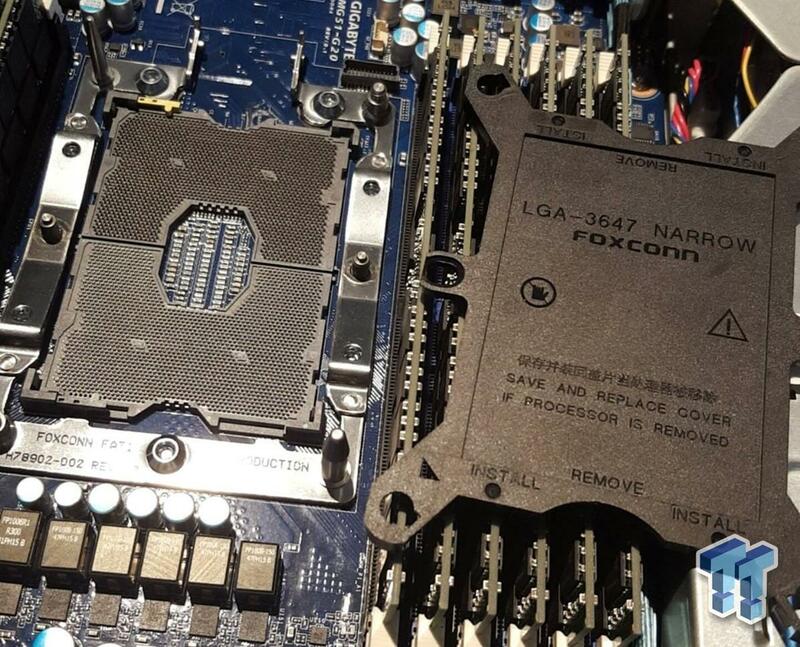 The socket features a rectangular shape compared to the boxed one we get to see nowadays on LGA 2011-3. A large metallic frame is placed next to the socket which could be support mechanism for coolers. The socket doesn’t look final as we can’t see levers that or metallic frames that are needed to fit chips on the socket. Intel Skylake-EP Chips will replace the Broadwell-EP chips on next-gen workstations and server platforms! While the socket is definitely huge and something to be noticed, our attention was quickly diverted to the ram slots. As you can see, there are a total of six DDR4 DIMM slots on one side of the socket which means that there are also six more on the other side. This kind of confirms that Skylake-E / EP processors would be upgrading the current quad channel memory support to hexa channel memory support allowing for even higher capacity in servers and workstations. With Skylake-EP, Intel will finally move to a brand new platform known as Purley which will be a scalable and unified platform supporting all 2S, 4S and 8S chips in the Skylake-EP and Skylake-EN lineup. It will feature the Storm Lake Gen 1 architecture which is the name for Intel’s next generation Omni-Path interconnect to be housed on this specific platform while the Lewisburg PCH will be powering the entire platform. The new fabric can deliver up to 100 GB/s interconnect speed with 56% lower latency compared to the current generation Infiniband Inter connect while allowing 48 ports with the new Switch Chip architecture. We can expect up to 28 cores, 56 threads and an insane amount of cache on these processors that will feature 45-160W TDPs with 6 channel DDR4 memory support and 48 PCI-Express lanes per chip. An 8S platform housing these chips will end up featuring 228 cores, 448 threads and 560 MB of L3 cache. The Skylake chips are expected to hit market in 1H 2017 with the new server board designs that include Wolf Pass, Buchanan Pass and Sawtooth Pass. The latest racks will fully support Intel’s Skylake-EP Xeon E5-2600 V5, Xeon E5-4600 V5 and Skylake-EX Xeon E7-8800 V5 processors that will be built on the current generation 14nm process node. 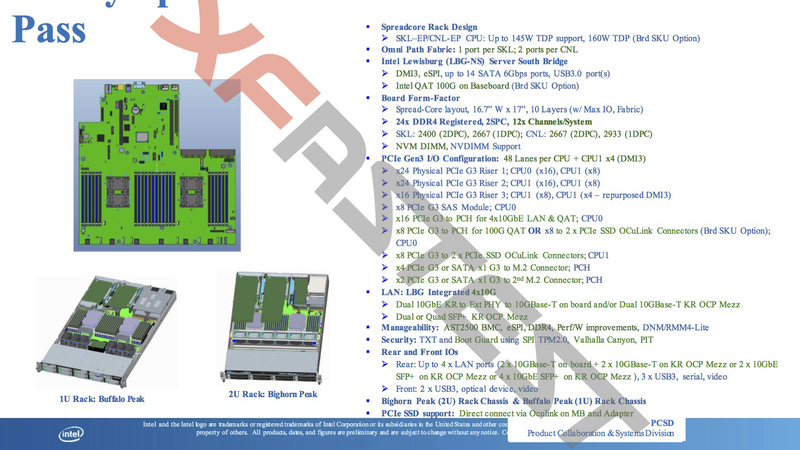 Moving to 2018, we will be looking at the 10nm Cannonlake-EP Xeon E5-2600 V6 and Cannonlake-EN Xeon E5-8800/4800/2800 V6 processors. There’s little known about Cannonlake at the moment but it seems like Intel will skip Kaby Lake and won’t include it in the server/workstation roadmap. The new Cannonlake-EP chips will retain all the features Skylake generation and include some new features too such as higher PCI-e lanes (more than 48), support for PCI-e Gen4 architecture on the latest server boards, higher core count (Up To 32 cores on Cannonlake-EX) and faster clocked DDR4 memory.